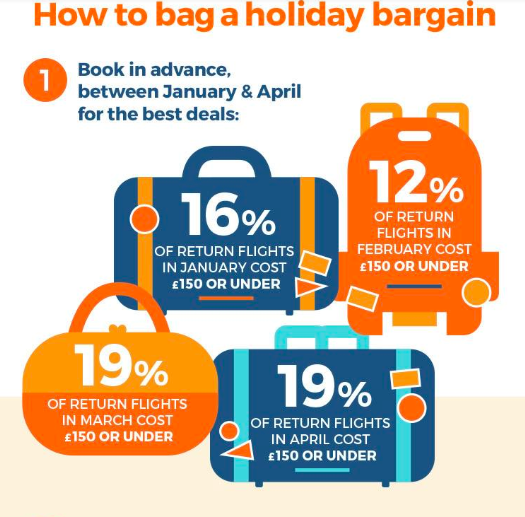 I love a bargain as much as the next person and I will always try and get the best deal possible when booking our summer holiday. I will admit however that I am not the best at haggling - I think I'm just a bit embarrassed about it all and most of my research and booking will happen through the internet. One of my good friends is the complete opposite to me and she was only just telling me this weekend that she managed to save over £1000 on her family holiday by playing four different travel agencies off against each other. It took her all afternoon walking between different agents but for that kind of saving, I think it's well worth it! Today I am teaming up with icount and sharing some of their top tips plus a few of my own for bagging the best deal and making sure your money goes a little further. 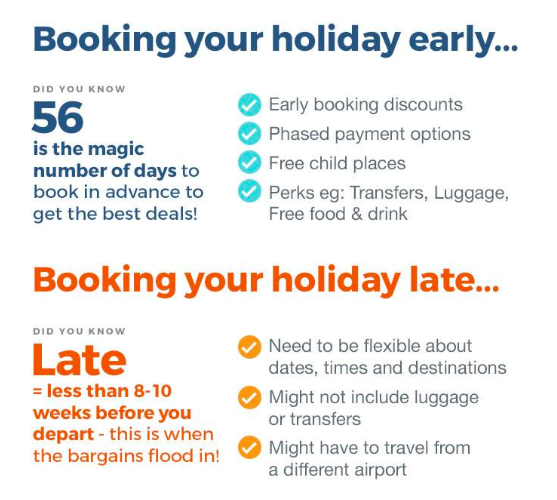 Planning a holiday at this time of year is not always the first option that springs to mind and if you have children in school and don't want to take them out to travel, February Half Term and Easter are going to be your best bet. Steve and I have travelled to Mexico in February and Cuba in April in the past and the main reason for this was because this was the cheapest time of year to go so I can certainly vouch for this research. After the longest winter ever this year, I've decided a February getaway is on the cards next year. If anyone has any recommendations for somewhere hot and sunny that won't break the bank at this time of year, please let me know. 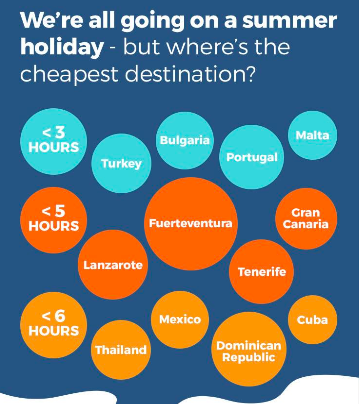 Below is a list of the cheapest destinations to travel to for your summer holiday. You may remember that we spent 10 days in Spain for less £1000 for the 5 of us in June 2016 so I am surprised to see that Spain's not on the list. I've been researching holidays for September recently and so far Spain and Greece are both coming out on top - I definitely need to look at the other options! I agree with Mexico and remember when we stayed there for £650 each for 2 weeks all inclusive when we were dating many moons ago. Those were the days! I don't think we'd be able to find a holiday at that price now. I'd definitely recommend Cuba if you're looking for a budget destination - prices are cheap as chips once you're over there and I've spotted deals for around £600 recently. Personally, I'd also add Florida to this list. There seem to be some huge bargains around at the moment if you're not too bothered about the theme parks - I spotted a deal for £1300 for flights, transfers and hotels for a family of 4 recently. That's in total, not each! Amazing. I find these deals by following independent travel agents on Facebook - just make sure they are fully protected before you book. So, is it possible? Can you book a family summer holiday for under £1000? After a bit of research, implementing the tips from icount's infographic below and as long as you're flexible, I'm pleased to say that you can. I recommend playing around with Skyscanner - I found flights for 2 adults and 2 children from London to Malta in the Easter holiday for £230 return in total and a quick look on AirBnB brings up apartments to rent for around £50 per night (£350 in total) which brings a holiday in at £680 excluding car hire which for the Easter holidays, isn't bad at all. There definitely are still bargains out there! 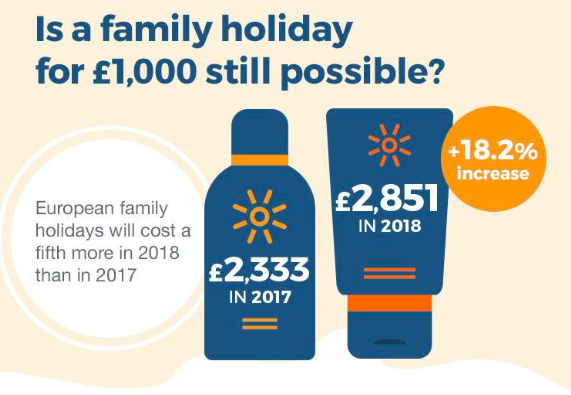 If you'd like more tips on how to holiday on a shoestring and save money when booking your summer holiday, check out the image below and make a note of the advice - it all works! Do you have any top money-saving tips for booking a summer holiday? Im really wanting to take the girls away this year so will be looking around for the best deals so this post came at the right time! This post has REALLY inspired me! I’m desperate for a holiday and after reading this I’ve decided to start shopping around for flights while they’re still cheap! Fancy a city break I think!